International Journal of Research in Health Sciences,2014,2,4,1117-1120. 1-Assistant Professor, 2-Postgraduate, 3-Professor, 4-Assistant Professor, Department of Pathology, Dr.Boddu Archana, Postgraduate, Department of Pathology, Karnataka, INDIA. Primary angiosarcoma of the breast is extremely rare and constitute 0.04% of all malignant breast tumors. Radiologic findings are often non specific and may appear completely normal in one-third of cases of primary angiosarcoma. The prognosis is usually poor, because of the high rates of local recurrence and early development of metastasis. 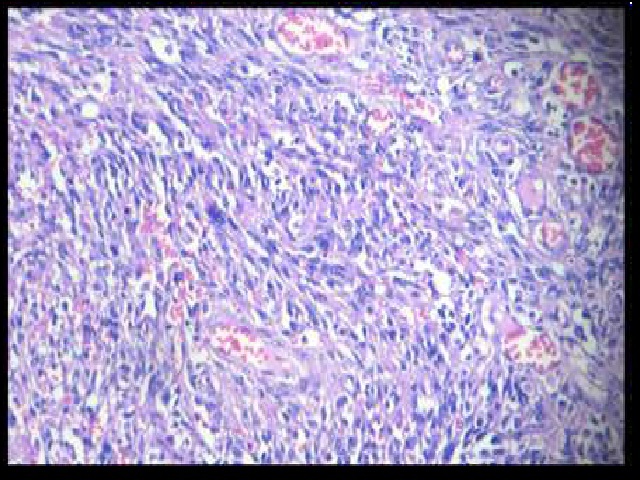 Here, we report this case of ours in a female of 45 year old who presented with left breast mass of 6 months duration with rapid growth.A diagnosis of angiosarcoma was made with the help of immunohistochemistry. A possibility of metastasis from other sites was ruled out.